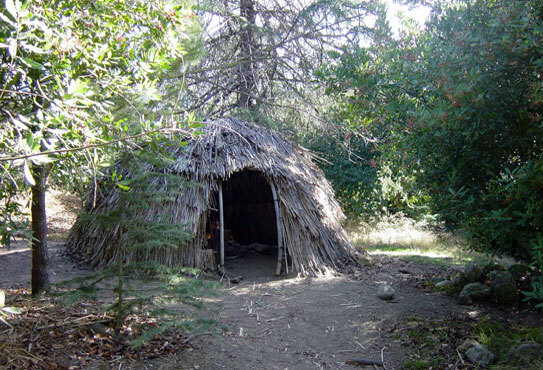 A reproduction of a Tongva hut exhibited at the Franklin Canyon outdoor teaching facility. 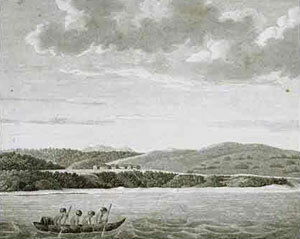 An etching from the 1700's showing coastal California Native Americans, and a Spanish map showing California as an island. Spanish map showing California as an island. Despite the fact that historians believe some of the largest concentrations of Native Americans lived along the Southern California coast, there is little evidence that touches our daily lives. Inspite of these prophetic words, we have little to cement our lives with those who lived before us for over 40,000 years. The reason is that few Native Los Angelinos survived the arrival of the Spanish and the subsequent conquest of the Americans. The tribes that occupied the LA area when the Spanish arrived were the Chumash and the Tongva (later called the Gabrielino), the Chumash being the older and more numerous. While similar, they spoke different languages. The Chumash were a seafaring people and lived along the coast north of Malibu. The Tongva lived in small settlements throughout LA and northern Orange couny, with a substantial settlement at Cahuenga Pass. In the Hollywood area, it is believed that the Tongva lived at the base of the canyons. For instance, Dr. Allan E. Edwards of UCLA suggests that a community of more than 200 lived at the junction of Franklin and Coldwater canyons. This gave them year-long access to fresh flowing water without being too far from the marshy flood plain - the vast cienegas that filled the flatland between Baldwin Hill and Beverly Hills. These marshes, which they navigated in reed canoes, contained a rich supply of the plants and animals that sustained them. With a little imagination, we can picture a Tongva settlement with reed huts and a communal sweathouse near a little stream at the site of the Chevron station at Sunset and Laurel Canyon Boulevard. The Tongva grew no crops and did not need to. Food was abundant, the weather was mild, and as a result, they were able to support a relatively sophisticated culture. However, these people rapidly fell into decline with arrival of the Spanish and their mission system, which was essentially agricultural slave labor. The people were converted and forced to live in confined areas where they worked on vast farms. The name Gabrielino derives from their later association with the Mission San Gabriel. The history of the Spanish dates back to 1542, when Juan Rodriquez Cabrillo anchored off San Pedro. But Spanish settlement did not begin until 1769 when Captain Gaspar di Portola led the only successful expedition sent by the Spanish Government in Mexico. Portola guessed correctly that the land would be very productive for agriculture, and as a result, many large ranchos were established by Mexican settlers. One of Portola's scouts, Juan Valdez, was among the first to settle, having returned with his family from Sonora twelve years after the expedition. He founded the Rancho Rodeo de las Aguas at what is now Sunset and Alpine Drive in Beverly HIlls. The nearby Hollywood area was divided by other Mexican families between Rancho La Brea and Rancho Los Feliz. They raised cattle and grew crops ranging from hay to bananas, pineapples and citrus, and there were even a few wineries in the area. But life was difficult. Lawlessness was the mode of the day, and property rights were only as strong as the land owner who enforced them. Nevertheless, one windfall for these early ranchers was an unusually strong rain storm that happened sometime in the early 1820's. It caused the Los Angeles River to shift its course from the sluggish outflow at Ballona Creek to a new channel that emptied at Long Beach. The result was the draining of the cienegas and the creation of premium new land to enlarge the ranchos. Pueblo de Los Angeles, as seen in this etching made in the early 1800's. The Spanish controlled the area until 1821, when a revolt in Mexico produced an independent country with ambitions for annexing California. Several battles were fought between Church-backed loyalists and secular Mexicans with the issue settled in favor of Mexico. But Mexican rule proved unstable with many changes in governorship and uncertain loyalties. After Mexico lost Texas to the Americans in 1835, the Spanish-speaking population of California became increasing concerned about the immigration of English-speaking American settlers, most of whom were drawn by the Gold Rush of the 1840's. Several clashes finally prompted President Polk to invoke Manifest Destiny with the result that Governor Pio Pico lost the war against a better-armed American army. The decisive battle took place on a site near Universal Studios at Lankershim. California - and Laurel Canyon - fell into American hands with the signing of the Treaty of Guadalupe Hidalgo in 1848. California became the 31st state in 1850. For more on the Spanish history of California, please visit http://www.aztecclub.com/campo/campo2.htm. "On April 4, 1850 Los Angeles was incorporated as a city. At the same time, the old landowners were being moved off their lands. Compelled to secure confirmation of their land grants in U.S. courts, one out of ten of the bona fide land owners of Los Angeles County lost his land and was reduced to bankruptcy. The more fortunate rancheros finally lost their special status as "Californios" and were absorbed into other communities, depending on their wealth or color." Unfortunately, the "liberation" of California was not a liberation for Native Americans. In fact, a new wave of extermination was begun by American ranchers and miners intent on ridding California of the last of its native population. The US government actually reimbursed bounty hunters (mostly out of work Civil War veterans) for the scalps of murdered Native Americans. One band was hunted down and murdered in Franklin Canyon. During this time, the entire Los Angeles area fell into anarchy as unsuccessful gold hunters, fugitives, dispossed Native Americans, ex-soldiers, aspiring farmers, ranchers and speculators, and even German Jewish merchants flooded the area. A severe drought in 1865 put the last of the Spanish rancho owners out of business. Preying on this happless population were bandits and outlaws who held out in mountain hide-a-ways, inlcuding one who reportedly hid in Laurel Canyon. His name was Tiburcio Vasques, a stage robber, a murderer and a romantic symbol of resistance to the American annexation of California. Bandits like Vasques and "other Mexican residents resisted the new Anglo powers by resorting to social banditry against the Gringos. In 1856, Juan Flores threatened the southland with a full-scale Mexican revolt. He was hanged in Los Angeles in front of 3,000 spectators. Tiburcio Vasques, a legend in his own time among the Mexican population for his daring feats against the Anglos", was finally caught at a sympathizer's ranch house at Kings Road and Santa Monica Boulevard in the area that is now West Hollywood. Before he was hung in San Jose, Vasquez delivered the following statement: "A spirit of hatred and revenge took possession of me. I had numerous fights in defense of what I believed to be my rights and those of my countrymen. I believed we were unjustly deprived of the social rights that belonged to us." A New York Tribune story on the hanging of romantic bandit, Tiburcio Vasquez in 1875. Things eventually calmed down, and the original Spanish ranchos were subdivided in the 1880's; and, in 1886, the town of Hollywood was established by H.H. Wilcox. (His wife gave the town its name.) This began the irreversible shift from agriculture to residences to business. "(Wilcox) planned the streets, paved Prospect Avenue (part of which still exists in Los Feliz but most of what is now Hollywood Boulevard) for the main street and was selling large residential lots to the more wealthy pilgrims coming to sunny California. Hollywood quickly became a prosperous community. Prospect Avenue was filled with Victorian, Queen Anne, and Mission Revival homes. Hollywood incorporated in 1903. In 1910 it became a part of the city of Los Angeles, largely over issues of water supply." View of early Hollywood looking north toward the Santa Monica Mountains. Early Hollywood as shown in this postcard of the period. The late 1800's marked a period of great immigration from the crowded and polluted cities of the East. Visions of Arcadia were being sold to Easterners who longed for a fresh start in an unspoiled land. Developers sought to match the Mediterranean climate with Andalusian dreamscapes of Spanish and Moorish homes. The result was a postcard for which Laurel Canyon provided the perfect backdrop. However, there was one problem: a lack of water. Stepping in to solve this was the horse trader, geologist and oil speculator, Edward L. Doheny. He and other land speculators bought land that they knew to be valuable to William Mulholland, who was a self-taught hydraulic engineer and the founder of the Department of Water and Power. Doheny's Franklin Canyon reservoir would become the main source of water for the DWP. Other water companies would follow, including one founded to exploit the spring-fed steam in Laurel Canyon. Despite all the new people and development, Laurel Canyon remained quite rural until well into the 1900's, with just a few cabins set on large tracts of homestead land. One of the more colorful residents of the time was Frederick Shaw, or Crazy Shaw as he was known to neighbors. Shaw owned several acres in the area of Hermit's Glenn, which is believed to be his namesake. From there, he went about town trying to interest townspeople in his visionary ideas about science and development schemes. Shaw's personality was so odd that an attempt was made to institutionalize him, but the effort failed. Serious development in the canyon was set in motion by Charles Spencer Mann, an engineer and real estate investor. (This is not the same Charles Mann who founded Mann Realty at Kirkwood and Laurel Canyon Boulevard - just an odd coincidence of history.) Mann and his water company partners bought property along Laurel Canyon Boulevard and up in the hills. He installed the nation's first trackless trolley in 1913 to bring residents and prospective buyers from the streetcar line at Sunset Boulevard to a roadhouse tavern at Lookout Mountain Avenue. The fare was 10 cents. He named his first development of verdant hillsides and running streams, Bungalow Land. Some critics of the time said he loved it so much, he nearly ruined it. The log cabin road house, that had a bowling alley in the basement, was later bought by silent film star Tom Mix. One of the last residents to occupy the cabin before it burned in the 1970's was Frank Zappa. Stanley Steamers negotiated the dirt Laurel Canyon Boulevard on the way to the Laurel Tavern, circa 1916. The site of the tavern later became the home of Tom Mix and still later, Frank Zappa. The trackless trolley on Laurel Canyon Boulevard, around 1913. The trackless trolley was retired after only five years as canyon transportation was replaced by Stanley Steamers and then by the automobile. With cars came paved roads that grew throughout the sub-divided canyon properties. And to further increase interest in his land, Charles Mann built a lavish inn at the crest of Lookout Mountain. From a local newspaper of 1912, "Alfred F. Priest has prepared sketches for a large three-story and basement hotel building to be erected in Laurel Canyon by the Canyon Castle Corporation, Chas. Mann and Sam S. Porter. The building is designed in the form of a letter U with extreme dimensions 200x150 feet. The basement will contain a large ballroom, card room, billard room, tonsorial parlor, laundry, storage and boiler. In the first story there will be banquet and dining rooms, office and main lobby, ladies parlors and kitchen department. The upper stories will contain seventy guest rooms with a dressing room and private bathroom for each. The interior finnish will be Oregon pine and white enamel with mahogony doors. There will be two passenger elevators, steam heat, plumbing, electric wiring, ice and refrigerating plant, vacuum cleaning system, etc. There will also be a garage, stable, tennis courts, golf links, etc. The cost is to be from $86,000 to $100,000, and it is expected that work will be started soon." A popular myth is that the grounds around the Inn were stocked with exotic animals for hunting, but this has not been verified. The Inn burned down in the 1923, and the site was rebuilt with a home for actor Lew Ayres - the original Dr. Kildare. he Lookout Inn, at the top of Lookout Mountain at Appian Way, had a commanding view of the LA Basin, the Pacific Ocean and the San Gabriels. Guests of the Lookout Inn playing to the camera in 1915. A postcard showing Laurel Canyon Boulevard at Lookout Mountain Road in the 1920's. The property on the right was developed by Harry Houdini, and the one on the left was owned by Tom Mix. His log cabin, which was the site of many rock star gatherings in the 1970's, can be seen just past the tree on the left.